Blues Rumba might be the solution you are looking for when you grow tired of shuffles and slow blues. In this article you learn how to intregrate this great groove into your repertoire. 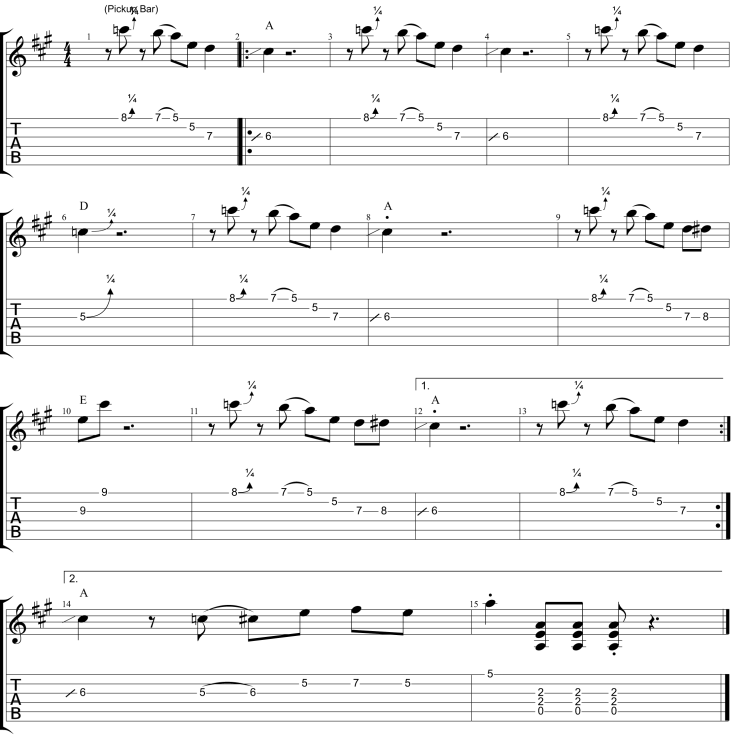 For our ‘Playing On The Porch’ approach we will use a Blues Rumba solo in the style of the great BB King. The main characteristic of a Blues Rumba is the rest on beat ‘2’. The second note is played on beat ‘2+’. Another typical attribute of a Blues Rumba is the straight 8th note feel. This is the basic Blues Rumba groove, the mother of all Blues Rumba grooves so to speak. I’ll show it in the open position (that is with unfretted strings), because later on, when we add solo licks, this will make things a lot easier. This kind of groove is used for example on the song ‘Woke Up This Morning’ (BB King, CD ‘Live At The Regal’, one of the greatest live recordings of all time) and a really rocking version is played on ‘Jailhouse Rock’ (The Blues Brothers, CD ‘The Blues Brothers Original Sound Track Recording’). This kind of groove is used for example on the songs ‘Crosscut Saw’ (Albert King, CD ‘Born Under A Bad Sign’) and ‘Don’t You Lie To Me’ (Gary Moore, CD ‘After Hours’). I show several more rumba grooves in my book “Garantiert Bluesgitarre lernen” (Alfred Music Publishing Germany, 2012, page 65-67) with song examples (and the CD titles where you find these recordings) for each groove. Ex. 3 shows a great lick in the style of BB King. During the first chorus the bass plays Blues Rumba groove 1 and during the second chorus Blues Rumba groove 2. Now try to add in ‘the other Blues Rumba groove’ (Ex. 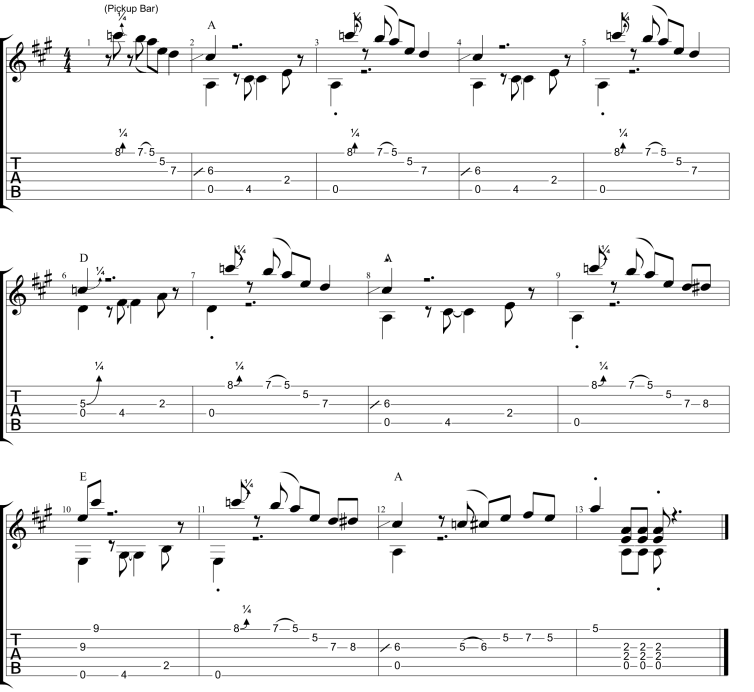 2) into this solo on your own . If you want to learn more concepts like this you should check out my ebook ‘Playing On The Porch – How to Play Blues Guitar On Your Own’, available on my website. If you subscribe to my free newsletter, you’ll get free play along tracks, free tutorial videos and other goodies regularly.